Herb gardening is so easy you’re doing yourself a disservice not to give it a try… even if you live in an apartment and had little success growing things in the past. Adding your own freshly grown herbs to all of the dishes you prepare is an excellent, easy and inexpensive way to improve the flavor and the health benefits of all your culinary adventures. 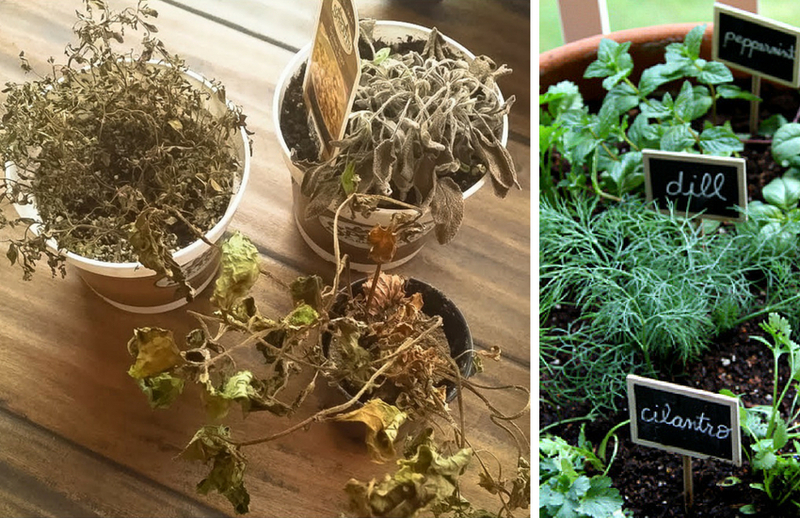 In this article, we will share some common mistakes that gardening newbies make when herb gardening. We will also provide some sound advice on avoiding them. Begin with nice, fresh garden or potting soil. If you are growing in containers, purchase a good brand of potting soil. You can keep this replenished by feeding the soil with used coffee grounds and crushed eggshells. These make an excellent, pH neutral, organic soil amendment. You can also compost your kitchen scraps to create excellent, rich soil; however, this is a topic for an entire article all on its own! When you buy a package of seeds it may seem you’re saving quite a bit of money; however, many things can go wrong when growing any kind of plant from seed. If you are new at gardening, you are far better off starting with seedlings. Realize that when you purchase a package of seeds you are in essence purchasing dozens of little pre-seedlings. You probably don’t need that many! Begin by purchasing one or two of the very healthiest looking seedlings available in your local grocery, home-improvement or gardening center. Take good care of these, and you should have plenty of fresh herbs to enjoy. Just as with any kind of plant, there are herbs that are difficult to grow and herbs that are easy to grow. Basil happens to be one of the easiest herbs. Start your growing adventure with a couple of strong and hardy basil seedlings. If you’re used to watering houseplants, you may have developed a habit of watering deeply once a week. For herbs, it is better to water lightly on a daily basis. Be sure to provide your herbs with plenty of drainage and light and airy soil to prevent over-watering, and give them a little drink every day along with a light misting. It goes without saying that all plants need lots of light. If you plan on using only natural light, be sure to set your indoor herb garden up in a south-facing window or sun porch. Choose full-spectrum tubes for the most natural quality of light. Just starting out, you should only have a couple of plants, but as you increase your garden be sure to provide ample bulbs for the number of plants you have. Don’t prune the bottom leaves. They should stay in place for the health of the plant. Make your first cut about 3 inches above soil level and above a growing set of leaves. Always trim above a growing set of leaves, not below. Remove buds as soon as they appear. All of these are very easy to grow and very useful in the kitchen. When adding to your collection, be sure you understand what types of herbs you are purchasing. For example, there are a couple of different kinds of oregano: Mexican and Mediterranean. These do differ in flavor. You may prefer one over the other, or you may wish to have both. Be advised there are also many different types of mint, and they are not interchangeable. Read up on the differences in flavor and collect your specimens according to your preferences. The tips presented so far have really been intended for pot and container gardening. However, if you do have an outdoor garden and intend to plant directly in the soil, understand that many herbs literally grow like weeds! Before planting be sure you understand the growing habits of the herbs you choose. For those, such as mint, that tend to overwhelm garden plots you may wish to opt for container gardening instead. It may be hard to imagine, but as your skills and success grow you may find yourself overwhelmed with a bumper crop of herbs. One of the best ways to deal with this is to simply consume fresh herbs in abundance. Sharing them with friends and family members is also a wonderful, generous way of managing your excess. Even so, you may end up with more herbs than you know what to do with. That’s why it’s smart to explore possibilities for freezing, drying, creating herb vinegars, butters and oils and much more. There are many creative ways to use and preserve herbs to enjoy and share all year round.